Eli Erlick (born July 10, 1995) is an American transgender activist, writer, and director of Trans Student Educational Resources. Eli Erlick was born on July 10, 1995. Her parents met while protesting, which she cites as a background behind her community work. She is of Jewish heritage and grew up near the rural community of Willits, California, where she said she experienced isolation, abuse, and violence, was not allowed to use the school restroom, and was threatened and bullied. At age 13, she transitioned to female, keeping her birth name. She then began her work in advocacy and writing while co-founded the organization Trans Student Educational Resources at age 16. She attended Pitzer College in Claremont from 2013 to 2016, where she graduated early with honors. Erlick cites starting her activism at age 15, in 2010, when she became a board member for a local LGBTQ youth conference. She first became public in media over a year later while advocating for California's School Success and Opportunity Act, the first state bill to protect transgender students. Erlick co-founded Trans Student Educational Resources, an organization "dedicated to transforming the educational environment for trans and gender nonconforming students through advocacy and empowerment." 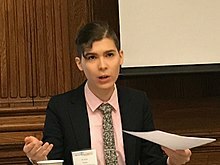 While advocating for comprehensive admissions rules for trans students at women's colleges, she spoke about the importance of remaining skeptical of all policy work. In 2015, Erlick published an article on why equality should not be the goal of the transgender movement. For her organizing, Erlick has been recognized in Refinery29 and The Advocate among other publications. In 2015, she led national efforts with Trans Student Educational Resources to admit trans women at women's colleges. She also co-authored Trans Student Educational Resources' model policy for admissions of trans students at women's colleges. Erlick also co-founded Trans Youth Leadership Summit, a program run through Trans Student Educational Resources and the only national fellowship program in the United States for transgender youth. Several of its fellows have gone on to become prominent media advocates, activists, and organizers since its launch. 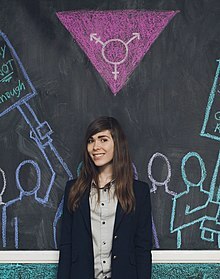 In 2017, she began publicly advocating for self-expression of gender-nonconforming transgender women. In 2011, at age 16, Erlick co-founded Trans Student Educational Resources, an organization "dedicated to transforming the educational environment for trans and gender nonconforming students through advocacy and empowerment." It is the only national organization led by transgender youth. She is currently the director of the organization. It is one of the largest transgender organizations in the United States. Erlick has written articles focusing on political philosophy, social movements, and transgender communities. In 2017, Glamour Magazine named her College Woman of the Year, the first trans woman to receive the honor in its 60-year history. She is currently a doctoral student at the University of California, Santa Cruz in its Feminist Studies Department. In a 2017 interview, Erlick stated she intends on becoming a professor. In 2016, Teen Vogue named her a "New Face of Feminism" as a "young feminist changing the game". Erlick also writes for culture publications including Teen Vogue and Glamour magazine about transgender and queer culture, media, and fashion. Erlick has appeared in publications discussing fashion. In an interview with Yahoo News, Erlick stated that she felt pressure to dress femininely based on the widespread conflation of gender identity and gender expression despite wanting to dress more masculinely. Erlick describes herself as gender nonconforming. 2013 Huffington Post Live Herself TV series; Episode: "How Can We Create Trans-Friendly Schools?" 2013 SBS Dateline Herself Documentary; Episode: "Crossover Kids"
2013 Huffington Post Live Herself TV series; Episode: "Transgender Student Athletes Fight To Compete"
2013 Huffington Post Live Herself TV series; Episode: "The Fight For Transgender Teen Rights"
2014 Huffington Post Live Herself TV series; Episode: "Making College Transgender Friendly"
2014 Huffington Post Live Herself TV series; Episode: "QueerView with Josh Zepps"
^ a b c "Who We Are – Trans Student Educational Resources". TransStudent.org. Retrieved November 1, 2017. ^ "Proposed Law Would Require School Support for Transgender Students citing radio". The Forum. KQED Radio. ^ a b "Changing Gender, Changing School". The Story. ^ a b "Trans woman shares gender expression journey, from 'femme to dapper'". Yahoo.com. Retrieved November 1, 2017. ^ "Meet Eli Erlick: A Trans Youth Activist Who Stars in Tegan and Sara's New Music Video "Faint of Heart"". TheQueerAV.com. August 19, 2016. Retrieved November 1, 2017. ^ Valens, Ana (December 20, 2017). "Ending Anti-Trans Violence Begins With Trans Rights in Everyday Life". Dailydot.com. Retrieved December 5, 2018. ^ "I Knew I Was a Girl at 8: Transitioning and Teenage Activism". AutoStraddle.com. September 30, 2013. Retrieved November 1, 2017. ^ "Gov. Brown signs transgender students' rights bill - News - KCRA Home". KCRA.com. Archived from the original on October 15, 2013. Retrieved November 1, 2017. ^ a b "What AB1266 Means for Transgender Students in Public Schools". Take Two. KPCC. ^ a b "Meet The Trans Teen Who Just Won $25K to Make Schools Trans-Inclusive". Advocate.com. November 19, 2014. Retrieved November 1, 2017. ^ Erlick, Eli (June 9, 2016). "Why Equality Is Toxic to the Transgender Movement". HuffingtonPost.com. Retrieved November 1, 2017. ^ "30 Under 30 S.F. — Rising Young Stars in San Francisco". Refinery29.com. Retrieved November 1, 2017. ^ Moyer, Justin Wm (May 4, 2015). "Smith College to admit transgender women in historic policy change". Retrieved November 1, 2017 – via www.WashingtonPost.com. ^ "Spelman Just Joined the Growing List of Women's Colleges to Officially Admit Trans Students". Brit.co. Retrieved November 1, 2017. ^ "Trevor Celebrates Transgender Day of Visibility". Thetrevorproject.org. Retrieved December 5, 2018. ^ "What Does The Trans Visibility Day Theme Mean? It's All About Resisting Oppression". Bustle.com. Retrieved December 5, 2018. ^ Truong, Kimberly. "Transgender Woman Side-By-Side Transition Photos". Refinery29.com. Retrieved December 5, 2018. ^ Erlick, Eli. "Why Trans Students Need Your Help Right Now". Glamour.com. Retrieved November 1, 2017. ^ Paul, Kari (November 12, 2018). "People protest Trumps proposed transgender policy with donations". MarketWatch. Retrieved December 5, 2018. ^ "Selected Writing". EliErlick.com. Retrieved November 1, 2017. ^ "The Winter 2014-2015 Edition of the Journal of the Student National Medical Association is here!". JSNMA.org. Retrieved November 1, 2017. ^ "Video: First transwoman wins Glamour's College Women of the Year award". ABC News. ^ "Campus Directory - UC Santa Cruz". Humanities.ucsc.edu. July 30, 2018. Retrieved December 5, 2018. ^ Militare, Jessica. "Meet Glamour's 2017 College Women of the Year". Glamour.com. Retrieved November 1, 2017. ^ "Young Feminists Changing the Game - Feminists to Watch in 2016". Teen Vogue. January 12, 2016. Retrieved December 5, 2018. ^ Erlick, Eli (May 19, 2016). "5 Examples Why North Carolina's Anti-Transgender Law Is Wrong". Teen Vogue. Retrieved December 5, 2018. ^ Erlick, Eli. "The Fight for Transgender Rights: Why Trans Students Need Your Help Right Now". Glamour. Retrieved December 5, 2018. ^ "100 Most Stylish dapperQs 2017 - dapperQ". dapperQ.com. June 1, 2017. Retrieved November 1, 2017. ^ "Trans woman shares gender expression journey". Yahoo.com. October 27, 2017. Retrieved December 5, 2018. ^ "What Halloween Means For Trans And Gender-Nonconforming People". Nylon.com. October 30, 2018. Retrieved December 5, 2018. ^ "QueerView with @JoshZepps". Huffington Post Live. October 2, 2014. Huffington Post. ^ "30 Under 30 S.F. — Rising Young Stars in San Francisco". Refinery29.com. Retrieved December 5, 2018. ^ "2015 Winners". Westly.org. October 17, 2016. Retrieved December 5, 2018. ^ "2012-16 Winners". Westly.org. Retrieved December 5, 2018. ^ "Trans Youth Leadership Summit". Davisprojectsforpeace.org. Retrieved December 5, 2018. ^ Militare, Jessica. "Meet Glamour's 2017 College Women of the Year". Glamour. Retrieved December 5, 2018. ^ Bendix, Trish; Jackson, S. E.; Hymowech, Gena; Long, Kat (June 22, 2017). "100 Women We Love: Class of 2017". GO Magazine. ^ Boureau, Ella (August 8, 2018). "29th Annual Lambda Literary Finalists and Winners". ^ "Videos - The Huffington Post". live.HuffingtonPost.com. Retrieved November 1, 2017. ^ "Crossover Kids". SBS.com.au. April 30, 2013. Retrieved November 1, 2017. ^ "The Fight For Transgender Teen Rights". HuffPost Live. November 20, 2013. ^ Ceron, Ella. "Tegan and Sara's Brand-New "Faint of Heart" Video Is Amazing For So Many Reasons". TeenVogue.com. Retrieved November 1, 2017. ^ News, ABC. "Video: First transwoman wins Glamour's College Women of the Year award". ABC News. Retrieved November 1, 2017. This page was last edited on 22 March 2019, at 15:02 (UTC).